In a decision that's stirring new debate about the future of California's power supply, utility regulators on Thursday approved a plan that clears the way for Southern California utilities to replace electricity lost to the state's energy grid when the San Onofre Nuclear Power Station shut down more than two years ago. The California Public Utilities Commission voted unanimously to allow Southern California Edison and San Diego Gas and Electric to develop new sources of electricity. The agency's order requires the companies to get at least part of the new power from renewable sources like wind and solar as well as through conservation and other measures. Specifically, the plan authorizes Edison to obtain between 500 megawatts and 700 megawatts of new capacity, with at least 400 megawatts coming from "preferred sources" like renewables. SDG&E won approval to procure between 500 megawatts and 800 megawatts of new power, with at least 200 megawatts coming from preferred sources. Any power that doesn't come from renewables is likely to come from gas-fired power plants. Some environmentalists say the CPUC's decision increases the odds of seeing more polluting energy as California seeks to address climate change, but Commissioner Mike Florio said no one in the world has managed to run a complex electricity grid without some fossil-fuel energy to handle unexpected shortages. Solar production, for example, surges during the day when the sun is shining, then ebbs. A statement from environmental groups said the decision raises the risk of "new, gas-fired power plants that are often built in low-income communities of color." They said existing gas plants are contributing to ozone pollution that leaves the Los Angeles basin with some of the dirtiest air in the country. While the decision "does require that a portion of the energy come from renewable sources, the utilities will ultimately get to choose where the bulk of the energy comes from, which could include natural gas," said the statement from the Sierra Club of California, the California Environmental Justice Alliance and Earthjustice. Another influential environmental group, the Natural Resources Defense Council, offered a more positive spin on the CPUC order. Sierra Martinez, the NRDC's legal director for the group's California energy initiatives, said in a blog post that the group is disappointed that the commission's decision authorized new gas-fired generation without taking full account of expected improvements in energy efficiency throughout the state. The final plan uses efficiency and other “preferred resources”—those resources with lower environmental impacts—like demand response (ways customers can consume less energy at key times during the day) and renewable energy such as wind and solar, as well as some upgrades to the electric system, to replace the vast majority of the lost SONGS generation. Today's order did not contain any specific blueprint for power generation. The utilities are developing plans to generate or buy the power, which must be submitted to the commission for review. Mark Nelson, Edison's director of integrated planning and strategy, said the company was planning to buy the power from the market, if needed. The company was earlier permitted to make major power purchases to compensate for older gas plants that are being phased out. "Some gas is required to keep the system reliable," he said. He said newer, cleaner-burning gas plants are not "inconsistent with cleaning up the environment." 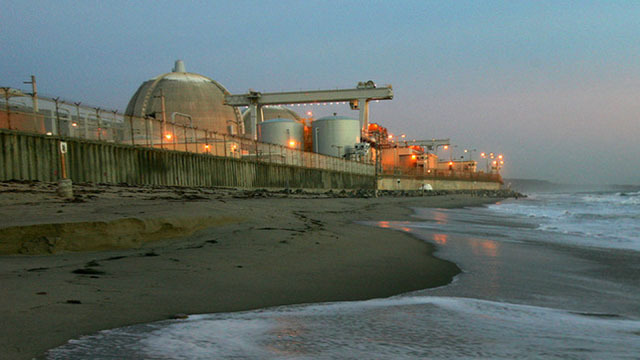 Production at San Onofre, on the coast in San Diego County, stopped in January 2012, after a small radiation leak led to the discovery of damage to hundreds of virtually new tubes that carry radioactive water. It was closed permanently last year amid a long and costly dispute over whether it was safe to restart. The plant had provided enough power for about 1.4 million homes. Original post: The California Public Utilities Commission is making a final decision today on how to replace the San Onofre nuclear power plant. The Southern California plant stopped generating power in 2012 after a radiation leak was discovered. It turned out there was more extensive damage to the plant, and in June 2013, Southern California Edison decided to close it permanently. The CPUC is expected to issue its decision on how to fill the 2,200 megawatt gap left by closing San Onofre in a meeting Thursday morning. The plan calls primarily for the use of clean energy, but one environmental group says it could leave too much leeway for dirtier energy to leak in. Under the proposal to the California Public Utilities Commission, the two utilities combined would be allowed to generate 1,500 megawatts of additional energy, so long as 60 percent of it came from sources like solar or wind, added efficiency, or voluntary conservation. This post contains reporting from the Associated Press and KQED's Molly Samuel and Dan Brekke.